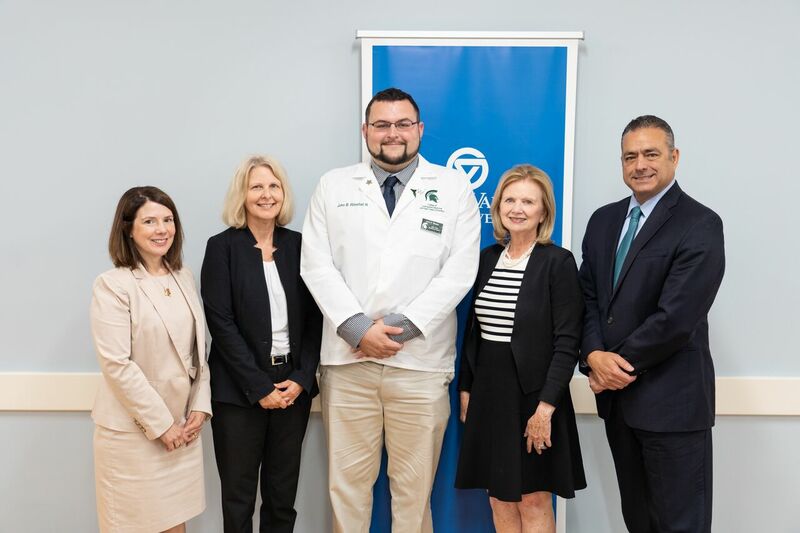 From (left to right) are Maria Cimitile, Jean Nagelkerk, John Westfall, June Youatt and Andrea Amalfitano, MSU College of Osteopathic Medicine interim dean. GRAND RAPIDS, Mich. — Qualified premedical students at Grand Valley State University will receive early assurance of admission into the Michigan State University College of Osteopathic Medicine following an agreement signed July 23. Leaders from both institutions signed the agreement at Grand Valley’s Raleigh J. Finkelstein Hall. The agreement reserves up to five positions for GVSU students per year. Jean Nagelkerk, vice provost for health at Grand Valley, said preference will be given to students who are recipients of Pell grants, first-generation college students, or graduates of a high school in a medically underserved rural or urban area. “We are so pleased our two public institutions are working together in partnership to help solve a physician shortage and fill gaps in the talent pipeline,” Nagelkerk said. John Westfall earned a bachelor’s degree from Grand Valley in biomedical sciences in 2014 and is now a second-year medical student at MSU COM. Westfall, who also played football for the Lakers, took a page from his playbook while giving advice to current GVSU students who are interested in applying to medical school. “Take advantage of the opportunities you are given and make sure to be collaborative and be a good team member,” he said. Westfall said he was turned down the first time he applied to MSU COM. “But they gave me feedback, which is a rarity among medical schools,” he said. Westfall said he turned the feedback into action and was accepted on a second attempt. “Now I believe that both these great institutions have provided me with a path to success,” he said. Maria Cimitile, Grand Valley’s provost and executive vice president for Academic and Student Affairs, said current Grand Valley students accepted into the MSU College of Osteopathic Medicine will not have to submit multiple medical school applications, affording them opportunities to concentrate on broadening their knowledge base and skill set during their senior year at Grand Valley. Qualified students can apply to the MSU COM program in early February for admission in 2020. Grand Valley and Grand Rapids Community College entered a similar agreement with MSU’s College of Human Medicine in 2012.